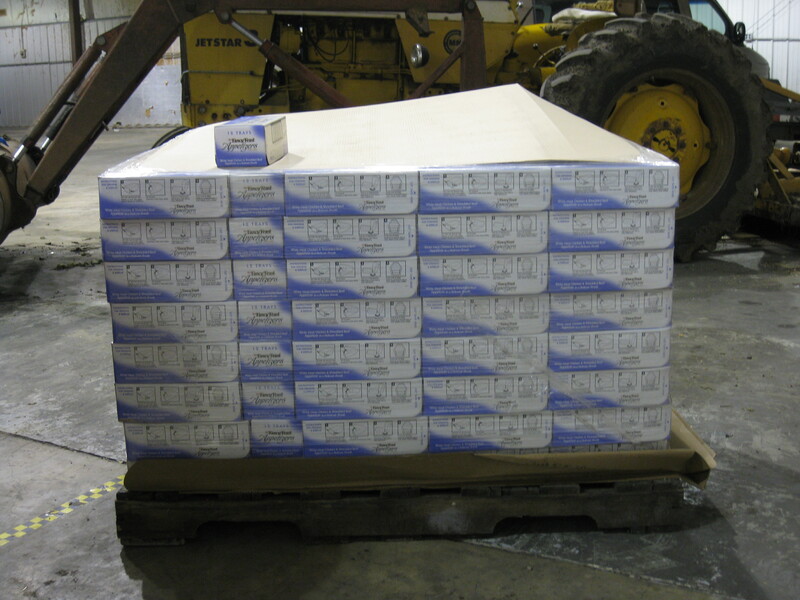 Last Thursday, I picked up a full pallet (skid) of cat food which had been donated to Feral Fixers by ASAP - the Animal Services & Assistance Program, Inc, out of Marengo, Illinois. We weren't given much notice on this - only two days - but fortunately this happened just after we suspended our TNR operations for the year. This meant that I wasn't transporting cats and so was fortunate enough to have that day free. ASAP helped out over a dozen animal welfare agencies that day by donating one or more pallets of food to them - both dog and cat food were available. The operation was very organized. Each group receiving food had signed up in advance stating which particular type of food they wanted and how much they wanted of it. We all then had to journey out to a warehouse in Harvard, Illinois, where the food was temporarily stored. When we got there, we signed in with Cindy Gaffney (the lady from ASAP in charge of the operation) and then waited our turn. A couple of people took turns handling the forklift truck and the cars/trucks were processed pretty quickly. If you had a truck (which we didn't have, unfortunately), you just dropped the tailgate - the pallet of food was deposited into your truck-bed, and off you went. If you did not have a truck, then you had to load your vehicle by hand. Everyone pitched in to help everyone else, so no one was stuck doing their entire load by hand. 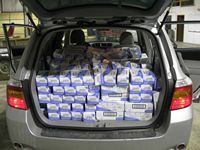 After I loaded up with cat food, I drove over to super-volunteer Mary's house and dropped off about 2/3's of it. Mary feed several colonies of cats and will make good use of this additional donation. The rest I brought over to Tammy's where it will be stored for future need. This load of wet cat food, along with the dry cat food recently donated to us by the PAWS-Chicago Spay/Neuter clinic allows us to distribute food as needed to our more needy (or busy!) colony caretakers. I believe this is the third time that ASAP has donated food to us and so we have to say THANK YOU ASAP - WE COULDN'T DO WHAT WE DO WITHOUT YOU! The two picture thumbnails show the 'before' (when the cat food was still on the pallet, wrapped) and 'after' (after the food was loaded into my son's SUV). Click on either picture thumbnail to see a larger version of the picture.